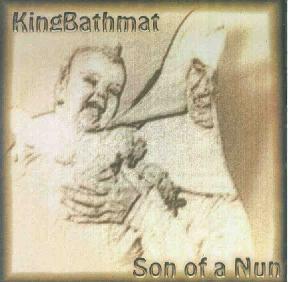 KingBathmat - "Son Of A Nun"
KingBathmat is John Bassett of Hastings, England. This 3 song CD is a sampler of the different kinds of music he's exploring. Not Born 2 Share is pure Carnaby Street psychedelic pop, with bouncy organ, weirdo sci-fi synth effects, and melodic guitar breaks. Post Traumatic sounds like a mid-80's rock tune that dives, midway through, into a far too brief Hawkwind-like space jam, before returning to its roots (though it does return to a bit of the freakiness towards the end). Uncle Remus is spacey in a slower way, with whooshing, theremin-like sounds punctuating it throughout. All three songs are in the 4-minute range, and follow to some extent conventional pop formulas, but Bassett throws in enough twists and strange effects to keep things interesting. You can contact KingBathmat via email at jobassett@lineone.net or via snail mail at: flat 6, 21/22 Conwallis Gardens, Hastings, East Sussex, England, UK, TN341LR.